We were told that it could be windy at the top, a typhoon was approaching. Occasionally we could feel the tower sway, but only slightly. The typhoon had not hit yet. This entry was posted in Japan and tagged kyoto, Kyoto tower, typhoon on December 29, 2015 by Traveltorgeir. I was sitting on a bench in Ueno Park in Tokyo nursing my hangover. Last night I had been to Golden Gai with a friend. We stayed later than planned. This entry was posted in Book Review, Japan and tagged Hideo Asano, human rights, legal system, literature, tokyo, Ueno on December 18, 2015 by Traveltorgeir. I mostly sat alone with my beer, listening to my friend and the bartender speak Japanese. Neither of them spoke much English, it was easier for them to converse in Japanese I guess. 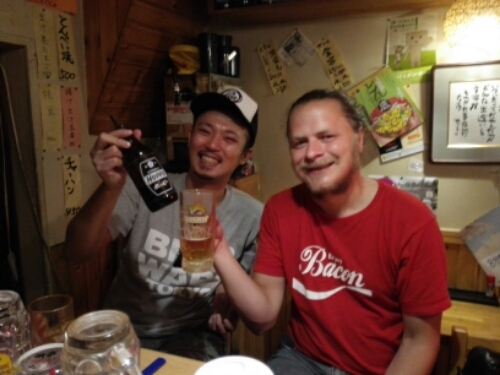 This entry was posted in Japan and tagged bar, drinking, Golden Gai, Shinjuku, tokyo on December 15, 2015 by Traveltorgeir. My friend was flying to Osaka on the 15th. He arrived late at night. He flew back to Thailand on the morning of the 20th. That gave him really only four days in Japan. I had planned for us to visit Kyoto. We would stay there the 16th and the 17th. This entry was posted in Japan and tagged Gion, Gion Matsuri, history, kyoto, shinto on December 10, 2015 by Traveltorgeir.